The sound of the Scottish music echoes around the Halifax Citadel National Historic Site in Nova Scotia, Canada as this bagpiper plays for the crowds. Dressed in his full Scottish uniform, a bagpiper needs a good set of lungs and quick fingers to keep the music flowing from his set of bagpipes. 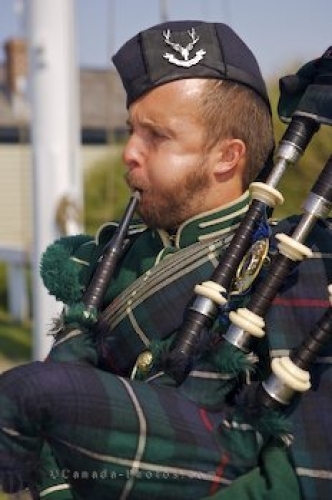 As the bagpiper blows into the chanter part of the bagpipes, he must play the proper notes while pushing on the bag with his other arm to release some air. Picture of a Scottish bagpiper at the Halifax Citadel National Historic Site.